We all owe Laura Thom and her volunteers a great big thank you for their participation in last Saturday’s Wards Corner Clean-up. 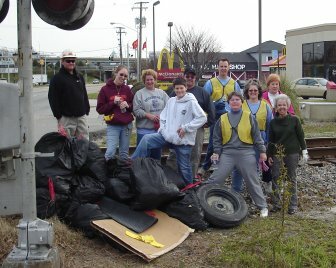 They collected over 40 bags of trash along the Norfolk Southern Railroad Tracks alone. Greater Wards Corner Partnership Meeting, Thursday, March 27th, 7 P.M. The Greater Wards Corner Partnership will be meeting this Thursday at the Norfolk Workforce Development Center 201 E. Little Creek Road (next to Kroger) at 7:00 P.M. The Codes and Public Safety Committee of the Greater Wards Corner Partnership will meet tomorrow night, Tuesday, at 645PM at the Workforce Development Center in room 210. Please join us if you would like to work with this committee. We need more members. The meeting should last no longer than 1 hour. According to a Pilot Online article, Bon Secours will appeal the State decision that denied the building of a new hospital in Virginia Beach, a 30 bed expansion of its Suffolk hospital, and a smaller replacement hospital for its 238 bed Depaul Hospital in Norfolk. Bon Secours has repeated said that DePaul will be closed if a solution is not found. It is time for the City of Norfolk to get very engaged in the appeal process to save DePaul Hospital. Tea Party 2 to hold a Norfolk city-wide town hall meeting Wednesday, March 26th, 7 P.M.
INCREASE Your Real Estate Taxes AGAIN! “GET A SECOND JOB” so you can pay more taxes, stop reading. concerning your Future Tax Bill. The Virginia State Department of Heath dealt a blow to Bon Secour’s Certificate of Public Need today by rejecting it’s plans for a new DePaul Hospital, Virginia Beach Hospital and an expansion of beds in Suffolk. The rejection of the C.O.P.N. will put it’s plans for a new DePaul Hospital on hold indefinitely. Pilot Online Article. I would like to share with all of you the following event that just happen in our area that you will not hear about in the news or from the city. On the evening of March 17, 2008, around 8:00 pm in the 200 block of Oxford Street, my neighbor was out for a walk. A dark SUV with tinted windows drove past him and turned into a driveway at the end of the block. This SUV then came back down the street past my neighbor and pulled into a driveway a few houses behind him. My neighbor heard the doors close on the SUV and then heard someone tell him to “Give it up”. When my neighbor turned around he saw two men with “hoodies” pulled up over their heads and two guns pointing at him. That evening my neighbor had done something he has never felt he needed to do in all his years walking in Talbot Park, carry his concealed weapon. My neighbor has a permit and is trained in the use of his weapon and for some reason he had a strong feeling to carry that night. That feeling probably saved his life this week. As my neighbor reached for his weapon one of the men fired a shot. Everyone ran in opposite directions. My neighbor was not hit but a stray bullet from the ‘would-be-thieves’ was free to do as it pleased. Naturally these two men will not be found as happens in most of these situations. The suspicion here is that this was part of a gang initiation, to rob someone at gun point. The fact that one of the men was willing to pull the trigger tells me he was ready and willing to kill someone if need be. This is the kind of story that goes on just about every night in just about every area of Norfolk that does not make it into the paper or on the TV news. Nobody got killed and in this case nobody got robbed so it is not news. What is news, in the paper and on TV, are the car break-ins in downtown and how something needs to be done about it. Being these break-ins are happening downtown and the fact that we have a “reactive” form of government instead of a “proactive” form of government, I am sure there will be immediate action taken to catch these thieves who are causing havoc in downtown. All the while the tax payers in the suburbs are being terrorized by gangs. If we are not willing to join together and take back our streets, but choose to ask our police to do that for us, than we need to insure our police force in Norfolk are second to none in Hampton Roads. Our police need to be the top paid with the best benefits and the latest equipment to fight crime. We need to stop giving tax breaks to developers that create large dirt piles for us to look at each day or empty condos that do not pay taxes. Before we reduce our tax base our police need to be fully funded and the BEST. We need a government that is “proactive” in its approach to crime (I was at the meeting in Wards Corner years ago were the city chose to ignore the evidence of gang activity we presented to them). The criminals have the upper hand; they have the will, focus and the stamina to do what it takes, no matter how long, to reach their goals. If you do not, then you will be hearing more stories like the one my neighbor told me last night. Only the outcomes may be deadlier and harder to live with. The criminals win and we continue paying for our loss, maybe with our lives. You are currently browsing the Wards Corner Now - Wards Corner, Norfolk, Virginia blog archives for March, 2008.